Right-wing agenda may be bad for Jews in Gloucester, Massachusettes. Trickle-down economics has missed the Jews of Gloucester, Mass., a historic fishing village 30 miles east of Boston, as it seems to have missed the rest of the American middle class. It was the night of Friday, Dec. 14, when a spectacular fire destroyed an apartment complex and an adjacent synagogue, Temple Ahavat Achim, on Middle Street in the heart of Gloucester's historic district. 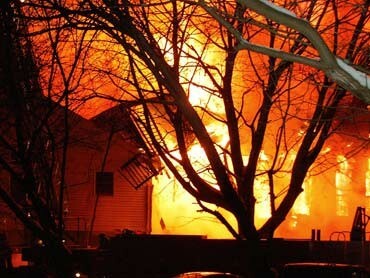 70-year-old Robert Taylor perished and more than 20 people were left homeless. In the days ahead, the two Americas we have come to experience were presented in stark contrast: The substandard firefighting performance was blamed on cost-cutting, yet the people of Gloucester swiftly rallied to help one another. Statewide 1980 "Proposition 2 1/2" severely limited the taxing authority of municipalities like Gloucester. Compounding this limited tax authority were the austerity budgets of four Republican governors, consecutively from 1990 to 2006, who sought to limit funds for social services, education and other domestic needs. Gloucester fire officials said statewide cost-cutting to municipalities in recent years weakened their fire department's abilities. Cuts to services throughout the state translated into a thinned-down fire-fighting shift. Fire also destroyed nearby Malden Mills in 1995, which owner Aaron Fuerstein spent $25 million of his own money to maintain his workers and to rebuild his family business. 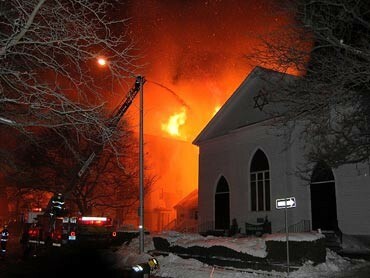 Ipswich residents and clergy organized December 20 to mark the loss of Temple Ahavat Achim. The community rallied together. Independent Christian Church, Unitarian Universalist Church, automatically allowed Jewish congregants to worship in its facility. A fund was established to aid the newly homeless tenants. Firefighters saved a menorah which was once in the possession of the late Israeli prime minister Golda Meir. A synagogue in nearby Swampscott supplied prayer books and a Torah. When there's tragedy, they come together, Rev. Wendy Fitting said, referring to the religious institutions in Gloucester; she is pastor of Independent Christian Church. When tragedy strikes, they come together in Gloucester and hundreds of other small towns and big cities. People are there for each other on a local and personal level. That is America at its best. The other America rears its disgusting head when callous, self-serving politicians hold power and apathetic Americans with little sense for the future will act according to their wants of the moment. The quartet of Republican governors in Massachusetts knew that cutting services was a crowd-pleaser and could never imagine that their prime security-challenged airport might ever be the launching point for a massive national tragedy. Before then, Massachusetts voters who were tired, perhaps understandably, of high taxes tightened the screws on expenses that might have prevented death and destruction in Gloucester. As Romney and other Republican presidential contenders brashly inject religion into their campaigns, Gloucester's Carole Sharoff (co-president of Temple Ahavah Achim) defined religion her own way in a Boston Globe interview. Religion is about a community of people that are charitable and respectful of human life, and the sanctity of human life and the conditions that people live in are so far more important than not having a building. The Republican governors who presided over diminished revenues for basic needs also managed Boston's Logan International Airport. It was this airport whose security system was breached by the hijackers who crashed the airplanes into the World Trade Center Twin Towers. Boston's record in baggage handling makes Philadelphia seem like a NASCAR raceway, according to some reports. They also presided over construction of the ?Big Dig? highway construction project that rose in price from $2.6 billion to $14.8 billion, took nine years longer than planned and was beset by serious defects leading to a motorist's death. ?It never should have taken so long. It never should have been so expensive," Michael Dukakis told The Washington Post. Dukakis was the last Democrat to occupy the governor's office before the Republicans moved in, the last of whom was presidential contender Mitt Romney. The Boston Globe reported that firefighting services have been sharply reduced in towns throughout Massachusetts. Democratic Gov. Deval Patrick.and state lawmakers want to allot more money to Gloucester and other towns, but they must now confront reduced federal relative to inflation. It is hardly news that the Bush administration has wasted billions of dollars on the Iraq war, sweetheart contracts to corporate friends and giveaways to Middle East and Asian rulers and tribal leaders. The campaigns of the right to slash taxes and privatize government services over the past 30 years is as obvious as a 30-second campaign spot. The Reagan agenda's impact on society is stark. Interestingly, as we spend billions of dollars on war and cut taxes for the rich, I have noticed how the postal service has reduced hours and public transit agencies have hiked fares in recent years. It could be argued that Robert Taylor, a tenant at the apartment complex, died because money was diverted, directly or indirectly, to far less important uses. That might also explain why more than 20 persons lost their homes and the building that housed Temple Ahavah Achim was demolished. In all the publicity about Aaron Fuerstein's battle to save his family business, sadly nobody mentioned he was also battling tax cuts. Bruce S. Ticker, who formerly published the CRISIS: ISRAEL Website, can be reached at community @ pjvoice.com.